CDROM and DVD drives (and WORM devices) are accessible via the sr upper level device driver. While is "sr" is the device driver name, "sr_mod" is its module name. The device file name is either /dev/sr<n> or /dev/scd<n>. Many Linux users have no SCSI devices (or adapters) in their systems. They become a little perplexed as to why cd writer software (e.g. cdrecord and cdrdao) and cd music reading programs (e.g. cdparanoia) use the Linux SCSI subsystem. The answer is that these programs need lower level access to these devices. ATAPI (ATA Packet Interface) is essentially a SCSI command set sent over an ATA  transport. The default action of the IDE subsystem in Linux is to claim all ATA devices for its drivers. In the case of an ATAPI cd writer, it will be claimed by the ide-cd driver. Once this has happened, the SCSI subsystem is unable to get control over an ATAPI device. The ide-scsi (pseudo lower level SCSI) driver can only register ATAPI devices in the SCSI subsystem that have not already been claimed by IDE subsystem. at kernel boot time pass the option: "hdd=scsi"
The first technique can only be done at boot time (and can be automated using lilo with an "append" in the /etc/lilo.conf file). It assumes that the main IDE subsystem driver is built in, which is almost always the case. The second technique assumes that the ide-cd driver is a module which is not normally the case (i.e. most distributions build it in). After one of these techniques has been applied, loading the ide-scsi driver should register the cd writer at /dev/hdd as /dev/sr<n> where the "n" is the next available number. 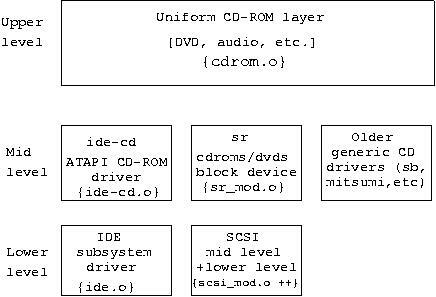 Once an ATAPI cd writer at /dev/hdd has been registered by the SCSI subsystem, then cdroms should be mounted via the "sr" device name and cd players should also use the "sr" device. Strangely the hdparm command should still use the /dev/hdd device file. Another less targeted approach is available when both the ide-cd and ide-scsi drivers are modules. That is to rmmod ide-scsi; rmmod ide-cd; modprobe ide-scsi.